Daily Illuminator: The Fantasy Trip Pocket Box!!! August 22, 2018: The Fantasy Trip Pocket Box!!! "Although we've resisted the decision for a long time, we've finally decided to discontinue our Pocket Box game line." That, as many long-time fans know, was the end of an era. Between the release of the Pocket Box in 1982 and the discontinuation of the packaging format in 1989, many classic games were released in the plastic Pocket Box. Car Wars, Ogre, Illuminati, The Awful Green Things From Outer Space, and more were sold by the tens of thousands in these plastic cases, and it was a shame when the boxes were no longer produced. Well, we may see the return of the classic Pocket Box and (as is appropriate) the first modern Pocket Box game may be a part of The Fantasy Trip Kickstarter project that closes on Friday. The $300,000 stretch goal brings a combined Melee/Wizard Pocket Box into the project, complete with new artwork by Liz Danforth! 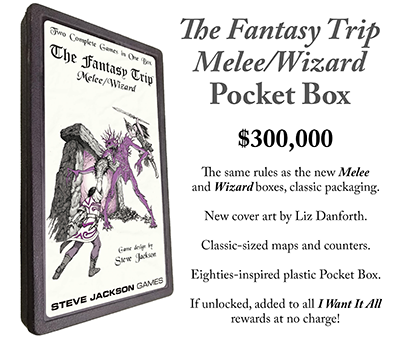 And for those fans of the Pocket Box of the '80s, this stretch goal (if unlocked) will pack in classic-sized Melee and Wizard maps and counters. Check out that great new art by Liz Danforth, and then back The Fantasy Trip today! We only have a few more days to reach that $300,000 stretch goal; please join in to help make this new Pocket Box a reality!